However, there is quite a bit of time and work involved in running OPAM, so Darling Kris and I have some guidelines we ask people to take note of AND please only sign up if you intend to follow through. If for some reason during the year you decide you don’t wish to remain part of the OPAM Challenge, just drop Sweet Peg or me an email to let us know. Please read through all guidelines before you sign up. 2. Numbers won’t be limited for the sign up for OPAM 2016, BUT ... it WILL close on February 1 ... You must sign up before that or miss out on joining in the fun. 5. Participants MUST have the OPAM Challenge badge on their blog sidebar and link it to either Kris’s or Peg’s blog. 6. Participants MUST keep a list of each month’s finishes on their blog sidebar and update it BEFORE the last day of each month. (This is easiest if you add each project as you finish it.) If you can put this directly under the OPAM badge on your sidebar it will be easier for Peg and Kris to find it. 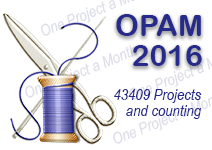 You may also choose to have a separate OPAM 2016 page on your blog. That’s fine too as long as it’s clearly labelled. So How does that sound!!!!! I'm in, for the ? ?th year. I appreciate the encouragement to keep making and being creative, and to have a list of what I've made each month is handy (and sometimes surprising). Thanks very much, Peg and Kris. hi, I´d love to sign up, but I can´t find an emailadress ! I'm in for sure. Will email the details. Thanks for organising this again. It's always very motivating. Could I please sign up again. My workshops have taken off so I will be making class samples and also I am in the throws of making costumes for the shcool play so i should have more this year. Will email my details and I might need a reminder on how to get the badge to actually change numbers. Many thanks for organisinng this again and I love the new badge design. PS.....Proud to be an Aussie! Happy Aussie Day! I was really hoping to join but as I do mainly hand piecing and hand quilting I don't think I would complete things fast enough. I shall , however, be looking at everyone else's achievements. Great idea. I'm so happy to be part of OPAM again. Huge thanks to you and Kris for organising it for all of us. I am so excited to join the OPAM group. I sent my info to Kris this morning! Thanks fo helping organize. Great new logo Sweet Peg and Kris! Yes poeas count me in again! A wonderful Sunday to you both!